Lyle: This lesson will teach you many new ways to play a simple chord progression, and those little jazz riffs you hear in the lesson sample. Lyle: It's almost a repeating 4 bar progression. Lyle: The GMaj9 is replaced with a GMaj7 every other time. Lyle: Then you repeat after 8 bars. But you are going to learn how to play a descending chord progression for all 16 bars. Lyle: Listen again to the chords in the lesson sample and you'll hear them start high and end up down low. Lyle: This is a basic II-V-I-VI chord progression in G.
Lyle: The object is to hold every note of the chord as long as possible, moving fingers only when absolutely necessary to arrive at the next chord. Lyle: You're going to learn this progression 4 bars at a time. Lyle: Learn those 4 chords and practice playing them along with the jam track. Lyle: Memorize this group of chords and try playing them along to the looping jam track. Lyle: Then see if you can play chords 1 - 4 and 5 - 8 all together. Lyle: These are good finger exercises. No stretching involved but still good for your fingers. andres: What would this progression be called, II V I ? Lyle: Now practice this group of chords with the jam track. Lyle: The little solo in the lesson sample is made in the key of G Major. andres: Is there a way to remember this trick in all situations, like if I was playing a blues progression? andres: :), isn't there an operation I can get instead? 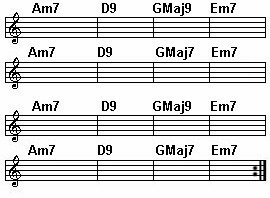 Lyle: Substitute any of these chords into your blues or any other progression. Lyle: This next one is the Bb Minor pentatonic, great to use over the D9 chord only. Lyle: Very simple scales and patterns. Greg: It's amazing the range of licks you can get with a few simple scales! Lyle: Yes, that's why it 's so important to learn your basic scales like all your Majors and Minors. Lyle: A plain scale can be used in so many ways, it's hard to say just one or two ways. Lyle: Like the Bb Minor pentatonic I used over the D9 chord, you wont find that in most lesson books! Lyle: Good luck on this lesson. Try to get all the chords down. It will be a small challenge for some tougher for others, and easy for some. Lyle: The Bb Minor pentatonic provides all the altered tones not found in the key of G Major. So when played against the D9 dominant chord it creates altered tones, giving you blues and outside sounds. radica: I like that one the best as well. Lyle: Time for me to take a break. See you again soon!